Annual reports have a core function; to effectively present the company’s financial strengths to shareholders, business audiences, employees, and the general public. Annual reports also have a great opportunity to tell a story; a story that is positive, confidence building and scene setting for the year ahead. 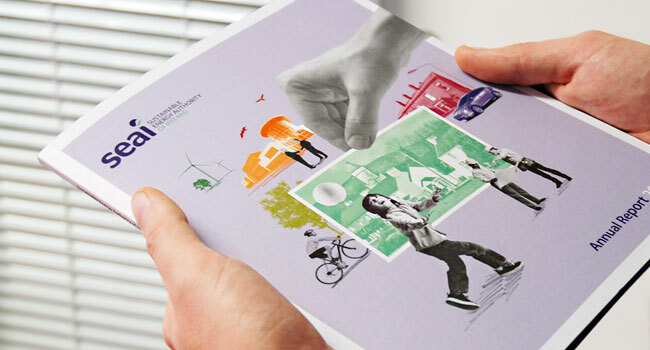 We placed emphasis on story telling whilst collaborating with SEAI on their 2013 Annual Report. SEAI work tirelessly on initiatives for business, industry, consumers and government, yet these initiatives while hugely successful are often not evident or visible. Our creative objective was to elevate the impact these achievements have and demonstrate how integral they are to our everyday. Playing with size, scale and a bold approach to presenting the numbers resulted in a visually engaging Annual Report that has received very positive feedback since launch.